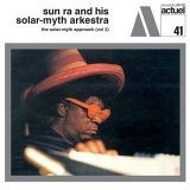 Recorded between 1970-1971, The Solar Myth Approach, Vol. 2 is comprised of solo keyboard explorations by Sun Ra, couched in between two free-form workouts by his whole Arkestra. Kicking off the set is the first band workout "The Utter Nots," which, amidst a relentless Afro-percussion backdrop, features a loose mix of fiery and mild statements by most of Ra's main soloists (alto saxophonist Marshall Allan, oboe player James Jackson, tenor saxophonist John Gilmore, et al.). The more frenetic of the two Arkestra features, "Strange Worlds," alternates between full band outbursts and cryptic keyboard and vocal interludes. The highpoints of the album, though, are Ra's wonderfully strange excursions at the keys. Evoking a child's outer-space play land, Ra produces a dizzying whirl of celestial noises on the Moog synthesizer for "Scene 1, Take 1" while switching the keyboard to harpsichord mode for a hauntingly beautiful meditation of baroque proportions on "Pyramids." The final solo finds Ra running amok over both the piano keyboard and the strings inside, producing a ghostly haze of sound.